Hello. I created SCPper (skipper) - an extension for Google Chrome that adds some functionality bits to this wiki and its translation projects that I personally find useful. It converts plain text into links, "fixes" forum and adds more info here and there. All features can be turned on and off. + Converts plain text (SCP-1234) into links to respective articles. - Converts plain text (SCP-1234) into links to respective articles. + When reading an article it adds name of the article from the main list to the title. - When reading an article it adds name of the article from the main list to the title. + Also adds information about page authors and contributors to the footer. - Also adds information about page authors and contributors to the footer. + Adds author page link to user info dialogue. - Adds author page link to user info dialogue. + Overrides default forum behaviour in such way that forum pages are added to browser history and you can navigate through them with Next and Previous buttons. + Adds tooltip with the article name to any SCP article link. - Adds tooltip with the article name to any SCP article link. As I said before it also supports translation sites to a various degree. Some features won't work on some sites due to differences in formatting and stuff. For example link to author page thing works only on the main wiki, korean and japanese branches. Most of the stuff should be fine though. Development is still ongoing and I plan to add other features later. For example I'd like to add author's name at the bottom of the page and maybe show quick summary of article in a tooltip when you hover you mouse over a link to said article. kak███: "Huh. This is pretty nifty tho." Yo traduje el artículo 682, pero me borraron la traducción. Incluía un informe de los científicos usando objetos SCP, incluyendo el famoso 173, para destruirlo. I can confirm, this is a cool plugin. If you're using Chrome, you need to be using this. Seriously. You need to be. This is rather a novel concept. Good work. I'll note that if you just want Previous - Next buttons, you can download a TamperMonkey plugin for Chrome from right here. Other than that: cool, if you'd like to host it on the Userscripts page, let me know. SCPper makes browsers own Previous page and Next page buttons (typically placed on a toobar) behave normally when you're browsing a forum thread. So if you started from the first page, then went to the third page and then clicked a link leading somewhere else, you can navigate back in the same order using "Previous" button or your browsing history. If I understand correctly usercripts add next and prev buttons to SCP articles so you can jump to the next (or previous) article with going back to main list. Correct me if I'm wrong, please. And the first major update for SCPper is out. Support for non-mainlist SCPs (-J, -ARC, -EX). And for decommisioned articles too, if they ever come back. Support for original articles of regional wiki branches (-RU, -KO, -CN, -FR, -PL, -ES, -TH, -JP). New "Smart" linkifier mode, used by default. 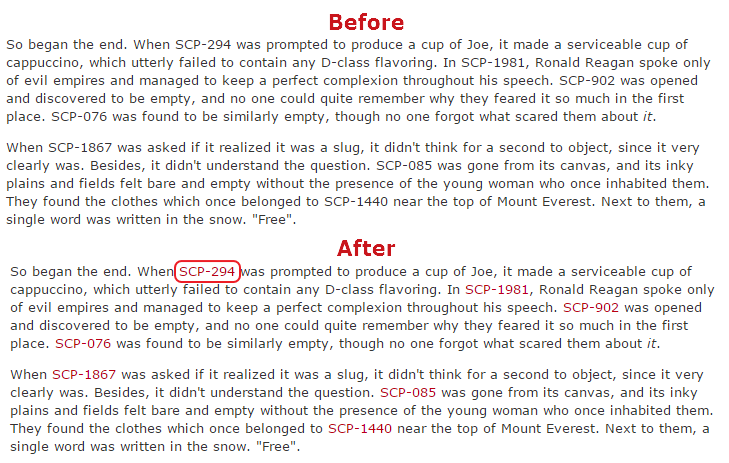 It converts plain numbers (123) into links on forum threads, but uses strict format (SCP-123) on wiki itself. P.S. To mods: I hope I'm not breaking any rules here by bumping this thread. I'm not gonna do this very often, only for significant updates. If that's not desirable, just say so and please don't delete/lock the thread, because I use my first message here to debug SCPper during development. New version of SCPper is out! With this release we bring you a brand new edge cutting feature: information about authors and contributors in the footer of the page as well as additional information such as date of posting and link to the original article for translations. Right now this feature is only available for English wiki, but I will release it for translation projects once I add a mechanism for users to report errors. Also, the database information is taken from updates once a week, so this feature may not work on freshly posted pages. Ummmm… does this work with the mobile site? I guess the answer to this is 95% No, but I thought I'd check just in case. Heads up, SCCP-2930 doesn't work with the linking and heading functions. I'm assuming it's the extra C.
Yep, articles with weird formatting are somewhat tricky to process and, honestly, I don't feel like trying to consider every possible format screw is worth my time, if possible at all. Any chance of a Firefox port for those of us who strongly dislike chrome? Sorry for the late answer (honestly, I though this thread was dead and buried). I toyed with the idea of porting it to firefox and I still may do it some time in the future, but don't hold your breath. Will we ever get a Firefox version of this? Sorry to say that, but at this point - not likely. I switched to other projects (like ScpperDB) some time ago and I don't really have time or desire to go back to this extension now. Initially I created it as a tool for myself and then shared it with the community. But, to be honest, I haven't been reading the wiki for quite a while now and the motivation to keep working on this stuff just isn't there anymore. That's a shame. I don't like Chrome because whenever I used it on my previous machine I would be spammed with Ads, and no adblocker I used worked. I use Firefox now because of that, along with a Firewall plugin. Thank you for making this it is really helpful. I really like how it shows the article name.